Fine original antique hand-colored wood engraving ladies fashion plate from the Home Magazine. Printed in the mid 1800's on quality period heavy paper, blank on reverse. Still retains its inherent structural flexibility and soundness. Sheet measures 6" by 9"
Fine original antique hand-colored wood engraving ladies fashion plate from Home Magazine. Sinclair Oil Civil War Centennial Map. United States Map featuring Civil War Battlefields and Sites. 1961. Vintage and collectible 25 x 36 inch Civil War themed modern United States folding road map, with battlefields and sites indicated on the map; there are text and illustrations about the war on the reverse side. Map in very good condition: no rips but edges are dogeared from use, no ink, pencil or highlighting marks, no stains. Collectible late 1800's fringed leather shotgun chaps. The chaps feature 2 work pockets. Stamped "Johnson & Co, San Francisco" on the back belt. Click on the pictures for more images. Sold "as is" and all sales are final. "Army Scenes on the Chickahominy"
Fine original antique wood engraving printed in Harper's Weekly. Sheet measures approximately 16" x 11" and the image measures approximately 14" x 9 1/2". "Birds-Eye View of Richmond and Vicinity"
"Blenker's Brigrade Covering the Retreat Near Centerville"
Framed COPY of original antique wood engraving printed in Harper's Weekly. Measures approximately 16" x 11". "Coats of Arms of the Several States of the Union"
"Fair Oaks Farm - Burying and Burning the Horses"
"Feeding the Poor at New Orleans"
"General Buell's Army Entering Louisville"
"General Halleck's Army on the Tennessee"
"General Stone's Division at Edward's Ferry, October 20, 1861"
"Map of Charleston Harbor, showing Fort Sumter and the Confederate Batteries." "Map of the North Carolina Coast"
"Ship Island and the Approaches to New Orleans"
"Stampede of Slaves to Fortress Monroe"
"The City of New Orleans"
Collectible - Wood Engraving The Corvette "Japanis"
"The Corvette "Japanis" Built for the Russian Government by W.H. Webb, of New York"
Fine ORIGINAL antique wood engraving printed in Harper's Weekly, 1858. "The Cotton Levee. Memphis Before The War"
Collectible - Wood Engraving The Egyptian Yacht "Voyageur De La Mer"
"The Egyptian Yacht "Voyageur De La Mer" Built at Boston"
"The First Peal For Liberty"
"The Great meeting in Union Square, New York, to Support the Government, April 26, 1861." "Barricade in the Treasury Building" and "The Eighth Massachusetts Volunteers in the Rotunda of the Capitol." Excellent condition: no rips , no ink, pencil or highlighting marks, no stains. Comic book in very good to excellent condition: no missing or ripped pages, no folded or creased pages, no ink, pencil or highlighting marks, no stains. Binding is firm, pages intact, no creases or cracks in the spine. Colors are bright. This is the Civil War edition of the "How and Why Wonder Book" series printed in 1961 by Wonder Books, Inc. This is a soft cover illustrated book with 48 pages. Book in very good condition: no missing or ripped pages, no folded or creased pages, no ink, pencil or highlighting marks, no stains. Cover has loosened from book. Pages binding is firm, pages intact, no creases or cracks in the spine. Comic book in excellent condition: no missing or ripped pages, no folded or creased pages, no ink, pencil or highlighting marks, no stains. Binding is firm, pages intact, no creases or cracks in the spine. Colors are bright. SOLD-Collectible Figurine - Norman Rockwell Heirloom Santa Collection "Christmas Dream"
This is the second issue of the Norman Rockwell Heirloom Santa Collection. Authorized and authenticated expressly for this edition by The Norman Rockwell Family Trust. This exclusive hand-numbered edition will forever close on the thirty-first of December Nineteen hundred and ninety-two. With brochure. 5 1/2" tall x 5 3/8" base. Excellent condition. No chips, cracks, or markings. Does NOT have original box. Fine ORIGINAL antique Civil War letter written and signed by Private Daniel Eddleman, 58th Regiment Pennsylvania Volunteers, Co C on December 22, 1863 in Washington NC. 4 pages plus transcript. Daniel writes his mother, sister and brother about successful raid they conducted on the confederates. "...we had orders to charge so we of on ful run with a charge baynet right for the camp we got to the shanties and we up with the buts of our guns and busted the dors in and thay dident know a thing about till we was in there shanties we got them all and all there horse and every thing thay had this is some paper that i got and this is a rebels invelap...you must excuse my bad writing for this is rebel paper and it just like them good for nothing..."
One of 4 letters from Daniel Eddleman. Eddleman was promoted to Corporal September 1, 1864. He was killed in action at Fort Harrison September 29, 1864. Fine ORIGINAL antique Civil War letter written and signed by Private Daniel Eddleman, 58th Regiment Pennsylvania Volunteers, Co C on May 19, 1862 Gosport Navy Yard, Portsmouth Virginia. 4 pages plus transcript. Daniel writes his father, mother, sister and brother about the camp neat Grosport Navy Yard and its complete destruction by the confederates. Daniel indicates they will march 160 miles to Richmond. He worries about carrying his knapsack as it has cut his shoulder on a short march. Fine ORIGINAL antique Civil War letter written and signed by Private Daniel Eddleman, 58th Regiment Pennsylvania Volunteers, Co C on May 30, 1862 near Gosport Navy Yard, Portsmouth Virginia. 4 pages plus transcript. Daniel writes his father, mother, sister and brother about the breastworks and canon lining the road to mount a defense against the confederates should they retreat from Richmond. He mentions that Washington is again in danger and that the home guard and five or six regiments of volunteers from New York have been sent to protect it. Fine ORIGINAL antique Civil War letter written and signed by Private Daniel Eddleman, 58th Regiment Pennsylvania Volunteers, Co C on May 8, 1864 near Petersburg. 4 pages plus transcript. Daniel writes his mother, sister and brother that he is now in an army of 60,000 men - first division third brigade eighteenth army corps. He describes their evacuation of Washington and subsequent travel via boat and roads to Petersburg where they wait for battle. Fine ORIGINAL antique Civil War letter written and signed by J. Crater to his brother on September 24, 1861 from Fort Taylor Virginia. Fort Taylor was part of the Arlington Line of fortifications to protect the City of Washington during the Civil War. 4 pages plus transcript. J. Crater documents the work on the fortifications and gun mounting at the fort. He describes the three Confederate forts being built within the sight of Fort Taylor. He mentions the positive comments made by General Kearny regarding the New Jersey volunteers. "...Gineral Kearney sais that them new regements are no good and wont have them with us attal they are the dumest set of men that he ever saw ... he sais that the first seckond third are the best drilled Vollenteers he ever sean he sais we ar as good as regulars..."
Formal Tuxedo Jacket, Vest, and Pants made by The Kibler Stores in the early 1900's. The suit is in excellent condition. Jacket and Vest are size 32. Pants are size 30. The inside seams of the jacket are edged in satin. The 1-button front jacket has 1 inside pocket. There are 3 buttons on the cuff of the sleeve. One sleeve is missing 1 button. Click on the image to see more pictures. From The Pen and Pencil Club, Columbus Ohio 1915 page 100: The Kibler Company was a member of the Hanger-Kibler Syndicate of one price clothing stores operated in Ohio, Massachusetts, West Virginia, Tennessee, and Indiana. They were the originators of the idea of selling men's clothing at one price throughout the entire season. Large antique collectible blue and white graniteware enamelware coffee boiler or pot with a wire bale handle in very good condition. The coffeepot measures 10 1/2" tall and has a 11" diameter base. The opening is 7 1/2". 8 page special about the Civil War in St. Louis commemorating the war's centennial. Magazine in very good condition: no missing or ripped pages except a 1" x 2" hole in the cover, no folded or creased pages, no ink, pencil or highlighting marks. See pictures. Enhance the presentation of the 150th Anniversary Civil War pen with a velvet lined, maple wood box. Pen avaialble at an additional charge. Click on the picture for more images. Collectible 2-tone brown and natural stoneware jug. 1 gallon size. Approximately 11" high x 7" wide. Excellent condition, no cracks, no chips. Collectible 2-tone brown and natural stoneware jug. 2 gallon size. Approximately 13" high x 9" wide. Excellent condition, no cracks, no chips. Collectible 2-tone brown and natural beehive stoneware jug. 1 gallon size. Approximately 10" high x 7 1/2" wide. Very good to excellent condition. No cracks. There a few chips on the body rim. Please see the detailed picture. 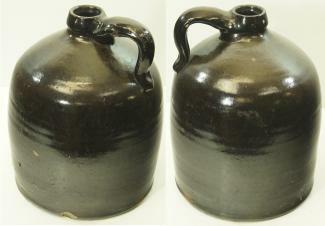 Collectible 2-tone Western Stoneware jug. 1 gallon size. Approximately 10" high x 7" wide. Excellent condition, no cracks, no chips. Collectible brown stoneware jug probably 1 1/2 or 2 gallon size. Approximately 12" high x 9" wide. Great condition, no cracks. There 2 chips at the base. Collectible bottle made of natural stoneware. The bottle is in excellent condition. No cracks or chips. 11" tall x 3 5/8" wide at the base. 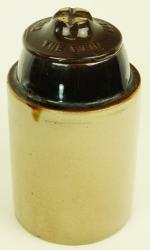 Collectible Bottle made of brown stoneware. The bottle is in excellent condition. No cracks, no chips. 10" tall x 3 5/8" wide at the base. 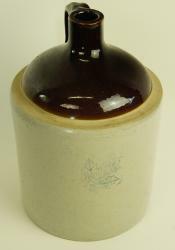 British Ginger Beer Bottle made of natural stoneware. The bottle is in great shape with one very tiny chip on the base. No cracks. The bottle is marked with an oval stamp. At the top of the oval is "H. Kennedy", at the bottom of the oval is "Glasgow", and at the center is "Barrowfield Potteries". The Barrowfield potteries were located in the East End of Glasgow. 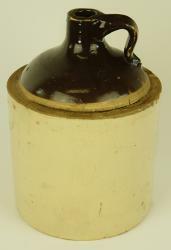 Ginger beer bottles were made by many companies in the Glasgow area, from the 1880s as the product was demand particularly in Canada and Cuba. The potteries were hit hard by WWI and the perception of glass being a more sanitary container lead to their decline. Barrowfield was closed in 1925. 8 1/2" tall x 3" wide at the base. SOLD-Collectible - Stoneware Canning Crock with Lid & Bale - 2 Tone "The Weir"
Collectible stoneware crock with Lid and Wire Bale. Labeled "The Weir, 3/1/1892 pat". Approximately 7 1/2" high x 4" wide. Excellent condition, no cracks, no chips. Collectible - Stoneware Canning Crock with Lid NO Bale - 2 Tone "The Weir"
Collectible stoneware crock with Lid. NO Wire Bale. Labeled "The Weir, 3/1/1892 pat". Approximately 7 1/2" high x 4" wide. Excellent condition, no cracks, no chips. Only 1 available. 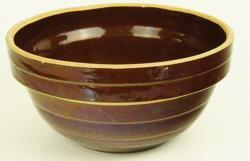 Collectible, vintage 7" brown glazed stoneware mixing bowl. Stamped "USA 7 IN" on the bottom of the bowl. The bowl is in excellent condition. No cracks or chips. 7" diameter x 3 1/2" high. 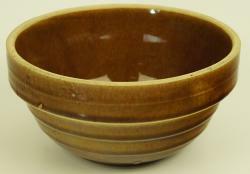 Collectible, vintage 9" brown glazed stoneware mixing bowl. Stamped "USA 9 IN" on the bottom of the bowl. The bowl is in very good condition. No cracks. 2 chips below the rim. These chips are on opposite sides but there is still an unblemished display side on the bowl. These chips measure approximately 1/4" in diameter and 1/2" x 3/4" respectively. Please see the detailed photos. The bowl is 9" diameter x 4 1/2" high. "I WILL MAKE YOU TOYS FOR YOUR DELIGHT..."
Crafted from imported porcelain hand decorated in the USA and crowned by a 22k gold-plated handle in the shape of a holly wreath. One side shows has a striking reproduction of one of Norman Rockwell's immortal portrayals of the jolly old elf himself, Santa Claus, in his workshop. The other side has the "I will" phrase. Approximately 4" tall. Excellent condition. No chips, cracks, or markings. Does NOT have original box. SOLD-Collectible Figurine - Norman Rockwell Heirloom Santa Collection "Santa Decorates the Tree"
The Centennial issue of the Norman Rockwell Heirloom Santa Collection. Authorized expressly for this edition by The Norman Rockwell Family Trust. This exclusive hand-numbered edition is limited to just 25,000 sculptures worldwide. With Certificate of Authenticity in original unopened envelope. 5 1/2" tall x 5 3/8" base. Excellent condition. No chips, cracks, or markings. Does NOT have original box. SOLD-Collectible Figurine - Norman Rockwell Home for the Holidays Collection "Christmas Eve at the Studio"
The premier issue of the Norman Rockwell Home for the Holidays Collection. Hand-painted depiction of Norman Rockwell's Arlington, Vermont studio and barn as decorated for Christmas circa 1940. Authorized by The Norman Rockwell Family Trust. SCULPTURE NUMBER 10376A in the hand-numbered edition limited to those produced on or before December 31, 1993. With numbered Deed of Ownership. 3" high x 6" wide x 3 1/2" deep. Excellent condition. No chips, cracks, or markings. Does NOT have original box. Collectible Figurine - Norman Rockwell Hometown Collection "Rockwell's Residence"
The premier issue of the Norman Rockwell Hometown Collection. Selected, authorized, and authenticated expressly for this edition by The Norman Rockwell Family Trust. This exclusive authorized limited edition will forever close on the thirtieth of September Nineteen hundred and ninety-two. With brochure. 2 3/4" high x 6" wide x 4 1/4" deep. Excellent condition. No chips, cracks, or markings. Does NOT have original box. SOLD-Collectible Figurine - The Franklin Mint Domed Figurine "Father Christmas"
Hand-painted Tesori porcelain Father Christmas figurine protected by a glass dome and set on a handsomely painted cold-cast base. Individually hand-numbered and is issued in an edition strictly limited to 95 casting days. With Certificate of Authenticity. Approximately 5 1/4" tall. Excellent condition. No chips, cracks, or markings. Does NOT have original box. Uses 2 AA batteries to operate Santa's lantern. Collectible Figurine - The Franklin Mint Domed Figurine "Grandfather Frost"
Hand-painted Tesori porcelain Grandfather Frost figurine protected by a glass dome and set on a handsomely painted cold-cast base. With Certificate of Authenticity. Approximately 5 1/4" tall. Excellent condition. No chips, cracks, or markings. Does NOT have original box. Uses 2 AA batteries to operate the lantern. This is the premier issue in The Norman Rockwell Gallery Tankard Collection. Featuring the artist's classic portrayal of Santa Claus, originally created in 1955. Fully authorized by The Norman Rockwell Family Trust. Approximately 8" tall. Includes Certificate of Authenticity. Excellent condition. No chips, cracks, or markings. Do NOT have original box. SOLD-Collectible Figurine - The Hamilton Collection International Santa Figurine Collection "Father Christmas"
This is the premier issue of the The Hamilton Collection International Santa Figurine Collection. Hand-crafted and hand-painted Victorian Santa with 24K gold accents on his lantern, staff and tassel. With brochure. 8 1/2" tall. Very good condition. One small chip on the greens - see photo. No other chips, cracks, or markings. Does NOT have original box. Music box play "Let it Snow"
Approximately 8 3/4"tall. Very good condition. No chips, cracks, or markings. Does NOT have original box. Uses 2 AA batteries to operate the lantern. Lantern DOES NOT light. "SING LOUDER AROUND TO THE BELLS' CHEERFUL SOUND..."
One side shows has a striking reproduction of one of Norman Rockwell's immortal portrayals of the jolly old elf himself, Santa Claus, warmly smiling out at us. The other side has the "sing louder" phrase. Approximately 4" tall. Excellent condition. No chips, cracks, or markings. Do NOT have original box. Collectible Figurine - Norman Rockwell Heirloom Santa Collection "Making His List"
This is the third issue of the Norman Rockwell Heirloom Santa Collection. Authorized expressly for this edition by The Norman Rockwell Family Trust. This exclusive hand-numbered edition will forever close on the thirty-first of December, nineteen hundred and ninety-three. 5 1/2" tall x 5 3/8" base. Excellent condition EXCEPT the quill on the feather pen in his right hand has BROKEN OFF. Otherwise, no chips, cracks, or markings. Does NOT have original box. Price reflects broken quill. We have been in the historical period clothing business since 1976 manufacturing all types of wool coats, wool jackets, wool vests, wool pants, cotton shirts, ladies dresses and more. We ship all over the world.